Figure 1. 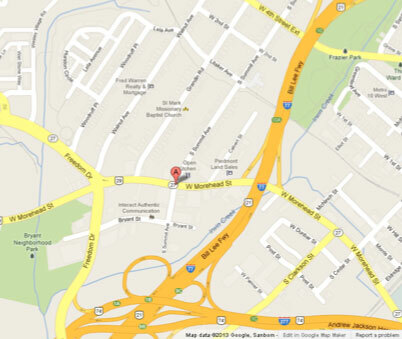 Map of the West Morehead Street area. Several generations of industrial use in the West Morehead district resulted in haphazard design features that were difficult for pedestrians and drivers to use. Sidewalks in rough condition created a tripping hazard for pedestrians. One issue in particular was the intersection of Freedom Drive and West Morehead Street, where pedestrians were not protected from free-flowing auto traffic when crossing. The West Morehead Streetscape Project decreased the number of lanes and increased pedestrian safety and streetscape appearance in this major thoroughfare. The project occurred on a .3-mile stretch of Morehead Street from Freedom Drive to the I-77 ramp. 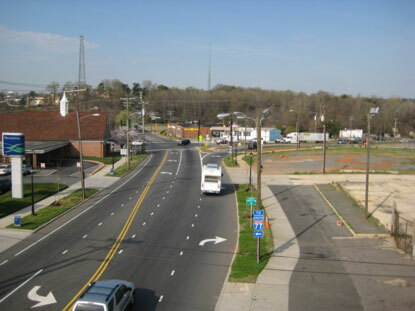 West Morehead Street is one of Charlotte’s historic industrial and commercial centers. The area was originally developed for industrial use, and little attention was paid to pedestrian or bicycle facilities. Today, only about a quarter of the West Morehead district is in industrial use, with about a quarter in retail, commercial, and office use, and the rest vacant and/or under renovation. After a period of decline, the district is experiencing renewed interest and investment in mixed-use development, due to its proximity to Uptown. To the North is Wesley Heights, a residential neighborhood. With requests for economic development coming in, not only was safety for cars a concern, but also for the increasing number of pedestrians and cyclists who would be accessing the area. Figure 2. After completion of the Streetscape Project on West Morehead. The City wanted to revitalize the corridor in order to increase economic development and pedestrian safety and to improve the streetscape appearance. 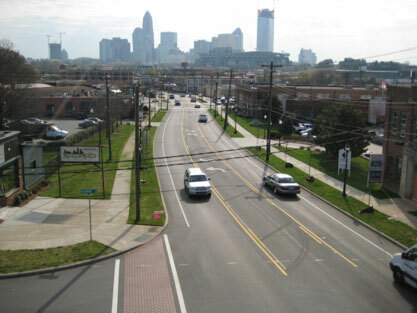 Many departments were involved in the planning process, including the Charlotte Department of Transportation, Charlotte-Mecklenburg Utility Department, Engineering & Property Management, Planning, and the NC Department of Transportation, as it was a state road. Making the area more pedestrian-friendly was recommended by the Westside Strategic Plan in 2000. City Council approved funds for the project in the 2000 Capital Improvement Program budget. Streetscape improvements were implemented through Pedestrian Overlay (PED) zoning, which required that the West Morehead Land Use and Pedscape Plan be adopted prior to PED rezoning approval. Adopted in 2004, the Pedscape Plan laid out plans to create a unified pedestrian system and standard site design features on in the district. Construction on the project started in 2006, and the landscaping was completed in 2008. The total cost was $2.6 million. The project altered the road to allow one travel lane in each direction, a center turn lane, and space for bicycle use in each direction. The street was reconfigured with pavement striping and was converted from four lanes to three lanes with a center two-way turn lane. The function of the intersection at Freedom and West Morehead was improved for pedestrians, and a left turn lane was added. Although there was not enough room for a dedicated bike lane, pavement striping was used to create a lane stripe for bicycle use, and “share the road” signs were added. Streetscape improvements included street trees, planting strips, and decorative lighting. Because the street is a state highway, restrictions prevented the City from constructing raised pedestrian medians, but these may be added later if approval is obtained. Figure 3. West Morehead at Freedom Drive. A traffic analysis that was conducted to determine impact showed a moderate decrease in vehicle capacity during rush hour, but virtually no change during other times of day. Before, average daily volumes on West Morehead east of Freedom Drive were 18,500, and after were 17,000. Project Manager Leslie Bing feels that the benefits of slower traffic speeds and improved safety for all outweigh the slowing of traffic during rush hour. Complete Streets features have been key to revitalizing this commercial corridor. Now, after the Streetscape Project, West Morehead serves as a gateway into the City. The project improved the quality of life for pedestrians, and economic development has boomed as well. According to Leslie Bing, before the project, only one restaurant existed on the street. Today, the number of businesses has increased, giving pedestrians different places to go, and a new development has been built north of Freedom Drive. Bing feels that the potential for increased development is beneficial to everyone, particularly now that those traveling to businesses on West Morehead do not have to drive. Bing, L. (2013, April 18). Discussion of West Morehead Streetscape Project.